Finance Minister Bill Morneau wants Alberta's energy workers to "retrain" for jobs in other sectors of the Canadian economy. Before you head out in search of greener pastures, here's a look at how Alberta's labour market fared in 2015 and why governments should be very careful what they wish for. This downturn is markedly different than the oil price collapse of 2009. The Wood Buffalo/Cold Lake area (which includes the region of Fort McMurray) was largely spared in the last downturn. This time, the oil producing regions in Northern Alberta have been hit the hardest, bringing their unemployment rate close to an unprecedented 8%. As seen in other parts of Canada, the province's capital region has fared better than Calgary. Edmonton has a more diversified population - more university students, more manufacturing, more oil refineries and more government jobs. In fact, the trend of lower unemployment rates is also seen in other capital cities across Canada such as Quebec City, Ottawa, Regina and Victoria. Not surprisingly, those without a high school diploma fare the worst in the province, a trend seen across Canada. However, Alberta is by far the best labour market for those without a degree, who face unemployment rates of 20 to 30% in Quebec and the Maritimes. Most interestingly, Alberta's unemployment rates are comparable for those with a university degree versus those who hold a post-secondary certificate (which includes all tradespeople). In fact, Alberta's trades workers fared slightly better than professional workers in 2015. As far as the big cities go, unemployment rates in Calgary and Edmonton are on par with Vancouver and Saskatoon, but still faring much better than Montreal or Toronto. Toronto has greatly improved since 2009. The Vancouver labour market has also much improved since unemployment rates peaked in 2011. Calgary, Edmonton and Saskatoon have deteriorated the most since 2014. If you're a tradesperson in the natural resources sector, particularly mining and oil & gas extraction, Manitoba and Saskatchewan have held up very well. 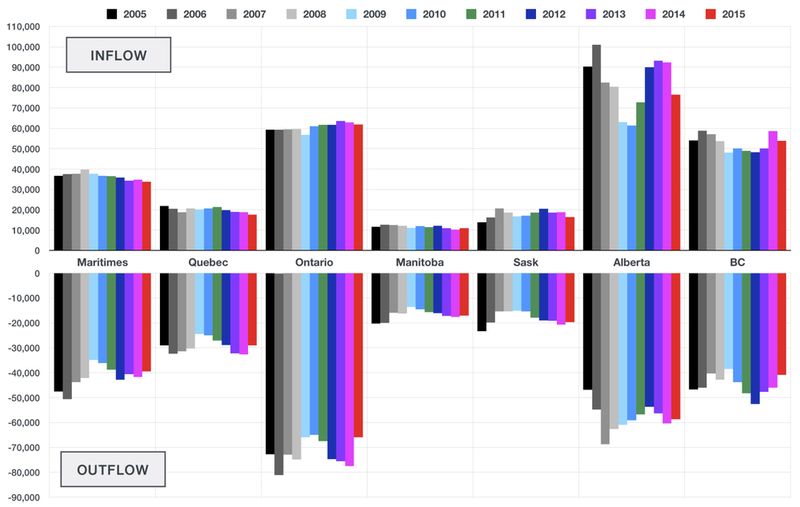 Ontario has also shown improvement over the past 5 years (note that Ontario and Manitoba are much more heavily weighted in mining over oil & gas). Alberta has seen a sharp jump in unemployed tradespeople in 2015, but is still faring better than BC. And there's no hope in sight for Quebec and the Maritimes. The prairie provinces have the lowest unemployment rates for professionals, which includes scientists, engineers and those employed in technical services. Alberta is the most deteriorated market for professionals in 2015, no doubt caused by the heavy losses in the large engineering houses in Calgary. Ontario is actually the most improved labour market for professionals, thanks in part to the thousands of unemployed engineers that have relocated from Ontario to Alberta in recent years in search of work. Although Ontario added almost 20,000 new professional jobs in 2015, salaries have actually declined by almost 10%. In fact, Ontario salaries for professional workers is now the lowest in Canada's four largest provinces. In contrast, although Alberta has lost 12,000 jobs in the professional services sector, salaries have held steady and modestly improved in 2015. Professionals in Alberta are paid 25% more than their counterparts in Ontario. Quebec is the most improved in 2015, with professional salaries jumping more than 10% in the first 10 months of the year. Despite the recent downturn, the biggest paycheques are still earned in the oil & gas sector. Most surprisingly, Alberta oil & gas workers still make 20% more than their counterparts in BC. And Alberta salaries have not weakened substantially in 2015. Factoring in lower provincial income taxes, Alberta oil & gas workers are by far still the highest paid sector of the Canadian economy. Manufacturing wage data is actually the most interesting. As the government reminds us on a daily basis, a lower Canadian dollar should spur Canada's manufacturing industry. Indeed, this is reflected in significant wage gains made for manufacturing employees in 2015, observed across in all provinces despite the weakening economy. Alberta's manufacturing workers earn a full 30% more than counterparts in BC or Quebec, and 20% more than Ontario. One other important take-away from the above graphs: as governments have expressed a desire to move away from oil & gas jobs towards manufacturing, note that those salaries are significantly lower. In Alberta, for example, manufacturing employees make 40% less than workers in the oil & gas sector. Salaries in other non-resource sectors, including retail, restaurants and hospitality are some of the lowest paying jobs in Canada. Alberta saw a sharp drop in migrants from other provinces in 2009/10, but that mass exodus isn't happening this time. Although Alberta has lost a lot of people to BC in 2015, droves of Canadians are still moving from Ontario to Alberta. What isn't clear is whether that migration is due to perceived greener pastures in Alberta or whether things are just really, really bad in Ontario. There has been a lot of talk from both the federal and provincial governments on diversifying Canada's economy away from energy and natural resources. Diversification is a good thing, but trading in good paying oil & gas jobs for lower paying jobs in manufacturing or tourism is not the kind of work government should be chasing. So instead of competing with Mexico to manufacture planes, trains and automobiles, governments should be creating high paying, high-skill, value-added work. And that should include supporting the natural resources sector, even at these depressed prices. Think pipelines across Canada, LNG exports from BC and the Ring of Fire development in Northern Ontario. That has the trickle-down effect of boosting government revenues from royalties and income taxes and helps support high paying engineering and even manufacturing jobs within Canada. Best of all, would also be 100% privately funded and requires zero taxpayer dollars. All of us who work in Canada's natural resources sector sincerely hope both the federal and provincial governments are listening. All data provided by Statistics Canada CANSIM tables updated January 8, 2016. Aug 12 How bad is Alberta's labour market?